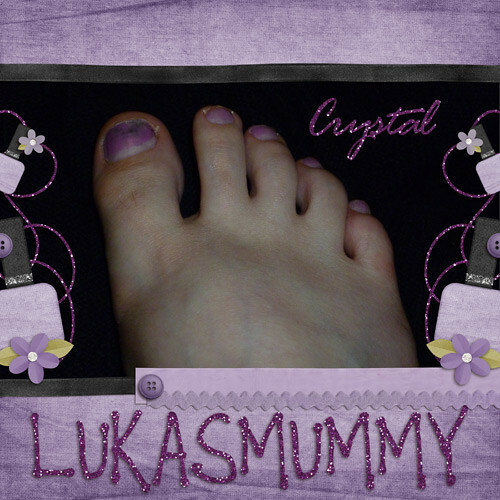 Pwetty Pink Piggies, originally uploaded by Lukasmummy. Credits: Layered template (Cut Out Templates, Template 4) by Elizabeth Albers (Scrapping With Liz) and Be Polished and Ribbon Templates by Laura White (C.W Picket & Company). Fonts are Engravers MT, Park Avenue BT and Pea Angedawn by Amanda Bottoms (Fonts For Peas). Journalling reads: It all started when I was looking through my make-up bag to see what I had for the wedding we were going to. Logan was fascinated by the single bottle of nail varnish that I had in there. He kept bringing me the bottle since he couldn’t understand what it was. I decided the only way to satisfy him was to show him what it was for. So I opened the bottle, lifted him on to my lap and I painted his big toe for him. He was thrilled and got all excited. He insisted on showing everyone. In our house it’s pretty much always a case of monkey see, monkey do. So Lukas decided that even though he hates pink with a passion, if Logan has one nail painted than he wanted one painting too. They seemed content with their single painted nail, or at least Lukas was. Logan was only pacified with that until he saw me painting my nails in an effort to hide the big ugly bruise on one of my toes. Then he decided that one nail was no longer enough. He demanded that I paint all of his nails just like mine. I decided that it just wasn’t worth that argument, I mean really so what if he wanted his nails painted, if he was a girl nobody would have said a word about it. So even though Mark didn’t like the idea, I did it anyway. Logan was really pleased when it was done, he kept looking at them and saying “pwetty, pwetty” “pwetty piggies” “pwetty pink piggies” it made him happy and that’s the only thing I really care about anyway. Enabling: Cut Out Templates by Scrapping With Liz available here, Be Polished by C.W Picket & Company available here, The Ribbon Templates can be found as part of this tutorial. 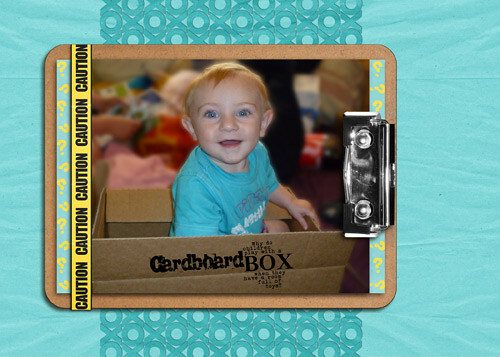 Playing In The Box, originally uploaded by Lukasmummy. Credits: Layered template (Valentines Card Templates, Template 2) by Elizabeth Albers (Scrapping With Liz), Box Wordart by Bethany Harty (Elegant Wordart by Bethany) and My Dear Watson by 3 Li’l Monsters Designs. Enabling: Valentines Card Templates by Scrapping With Liz available here, Box Wordart by Elegant Wordart by Bethany available here and My Dear Watson by 3 Li’l Monsters Designs available here I linked you to the bundle since it’s on sale! 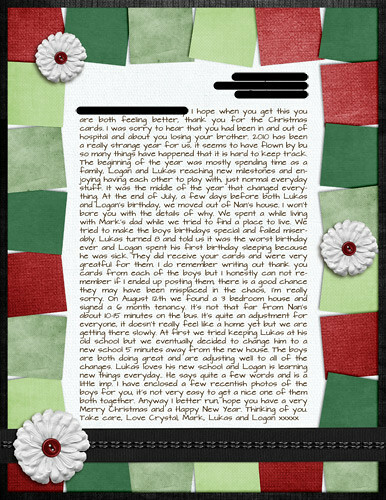 Christmas Letter 1, originally uploaded by Lukasmummy. Credits: Layered template (Christmas Newsletter Templates, Template 3) by Elizabeth Albers (Scrapping With Liz) and Merry Christmas by C.W Picket & Company. Font is Architects Daughter by Kimberly Geswein. Bedroom Tent, originally uploaded by Lukasmummy. 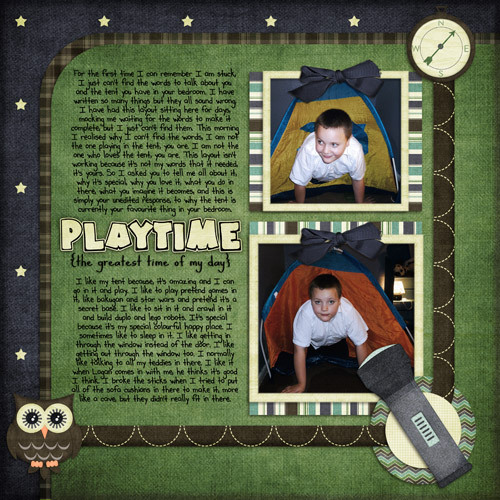 Credits: Layered template (Curve Concepts,Template 3) by Elizabeth Albers (Scrapping With Liz), Camp Out by Laura White (C.W Picket & Company) and Playtime Wordart (slightly recoloured) by Wordart World by Jennifer. Fonts are Pea Beth by Amanda Bottoms (Fonts For Peas). Journalling reads: For the first time I can remember I am stuck, I just can’t find the words to talk about you and the tent you have in your bedroom. I have written so many things but they all sound wrong, I have had this layout sitting here for days, mocking me waiting for the words to make it complete, but I just can’t find them. This morning I realised why I can’t find the words, I am not the one playing in the tent, you are. I am not the one who loves the tent, you are. This layout isn’t working because it’s not my words that it needed, it’s yours. So I asked you to tell me all about it, why it’s special, why you love it, what you do in there, what you imagine it becomes, and this is simply your unedited response, to why the tent is currently your favourite thing in your bedroom. I like my tent because, it’s amazing and I can go in it and play. I like to play pretend games in it, like bakugan and star wars and pretend it’s a secret base. I like to sit in it and crawl in it and build duplo and lego robots. It’s special because it’s my special colourful happy place. I sometimes like to sleep in it. I like getting in through the window instead of the door. I like getting out through the window too. I normally like talking to all my teddies in there. I like it when Logan comes in with me, he thinks it’s good I think. I broke the sticks when I tried to put all of the sofa cushions in there to make it, more like a cave, but they didn’t really fit in there. Can he break it? Yes, he can!! Can he break it? Yes, he can! !, originally uploaded by Lukasmummy. Credits: Layered template (Handy Helpers 2, Template 4) by Denise Tilley (DigiDesigns by Denise), Background Templates by Elizabeth Albers (Scrapping With Liz), Tool Box by Laura White (C.W Picket & Company) and June Wedding Glitter Styles by Jewel Goodwin (Mad Genius Designs). Fonts are FO Textura and FO Textura Traced both by Fontologie. Journalling reads: This is exactly why I do not like it when Mark starts to play with the power tools. For some reason his insane male brain told him it would be a good idea, to take off the safety guard on the router while he was working with it. He ended up cutting into the end of his thumb and taking a very long trip to A&E. After an x-ray they saw that not only had he cut part of his thumb off, he had also shattered a bone in his finger, and he had also completely destroyed the nail and nailbed. He ended up having some Day surgery to remove a shard of bone and 6 weeks off of work. Because when it comes to tools, he is an absolute idiot!!! 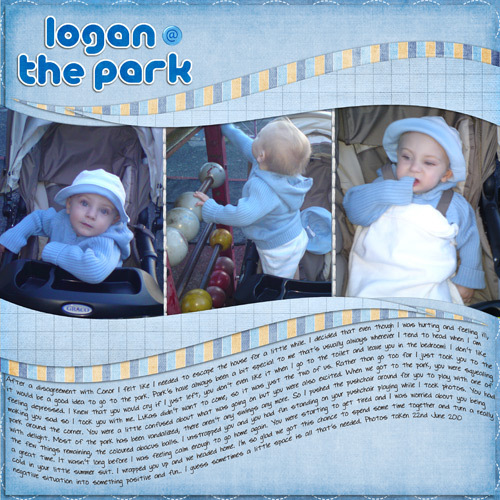 Logan @ The Park, originally uploaded by Lukasmummy. 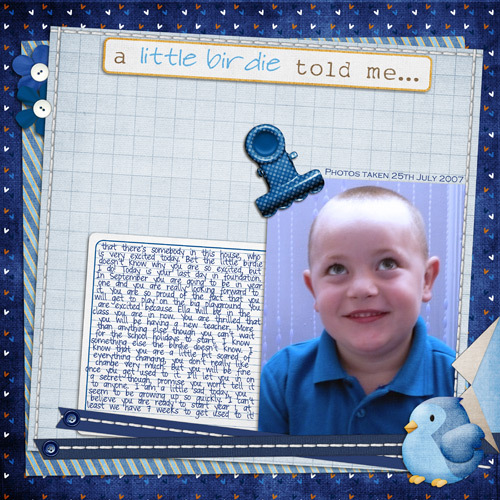 Credits: Layered template (Fun With Text, Template 1) by Elizabeth Albers (Scrapping With Liz) and Something To Say by Amanda Krueger (Nibbles Skribbles) and Laura White (C W Picket & Co). Font is DJB Journal Bits by Darcy Baldwin. Journalling reads: After a disagreement with Conor I felt like I needed to escape the house for a little while. I decided that even though I was hurting and feeling ill, it would be a good idea to go to the park. Park’s have always been a bit special to me that’s usually always wherever I tend to head when I am feeling depressed. I knew that you would cry if I just left, you don’t even like it when I go to the toilet and leave you in the bedroom! I don’t like making you sad so I took you with me. Lukas didn’t want to come, so it was just the two of us. Rather than go too far I just took you to the park around the corner. You were a little confused about what was going on but you were also excited. When we got to the park, you were squealing with delight. Most of the park has been vandalized, there aren’t any swings any more. So I pushed the pushchair around for you to play with one of the few things remaining, the coloured abacus balls. I unstrapped you and you had fun standing on your pushchair playing while I took photos. You had a great time. It wasn’t long before I was feeling calm enough to go home again. You were starting to get tired and I was worried about you being cold in your little summer suit. I wrapped you up and we headed home. I’m so glad we got this chance to spend some time together and turn a really negative situation into something positive and fun. I guess sometimes a little space is all that’s needed. Photos taken 22nd June 2010. A Little Birdie Told Me, originally uploaded by Lukasmummy. Credits: Layered template (Folded Paper Templates, Template 4) by Elizabeth Albers (Scrapping With Liz) and Something To Say by Amanda Krueger (Nibbles Skribbles) and Laura White (C W Picket & Company). Fonts are DJB Erika by Darcy Baldwin and Copperplate Gothic Light. Journalling reads: that there’s somebody in this house, who is very excited today. Bet the little birdie doesn’t know why you are so excited, but I do! Today is your last day in foundation. In September you are going to be in year one and you are really looking forward to it. You are so proud of the fact that you will get to play on the big playground. You are excited because Ella will be in the class you are in now. You are thrilled that you will be having a new teacher. More than anything else though you can’t wait for the school holidays to start. I know something else the birdie doesn’t know. I know that you are a little bit scared of everything changing, you don’t really like change very much. But you will be fine once you get used to it. I’ll let you in on a secret though, promise you won’t tell it to anyone. I am a little sad today, you seem to be growing up so quickly. I can’t believe you are ready to start year 1, at least we have 7 weeks to get used to it! 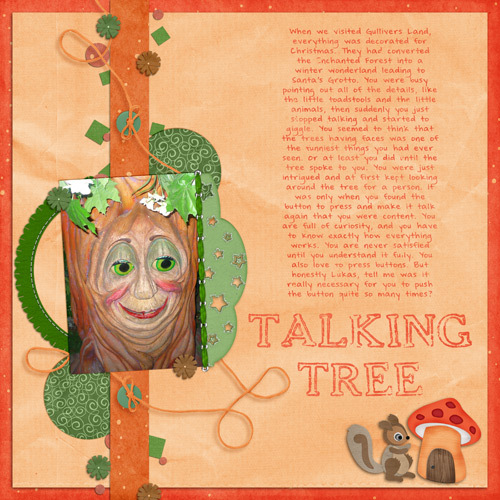 Talking Tree, originally uploaded by Lukasmummy. Credits: Layered template (Vertical, Template 1) by Elizabeth Albers (Scrapping With Liz and Once Upon A Time by Jewel Goodwin (Mad Genius Designs). Fonts are DJB Mat by Darcy Baldwin and FO Empty Wrapper In Between by Fontologie. Journalling reads: When we visited Gullivers Land, everything was decorated for Christmas. They had converted the Enchanted Forest into a winter wonderland leading to Santa’s Grotto. You were busy pointing out all of the details, like the little toadstools and the little animals, then suddenly you just stopped talking and started to giggle. You seemed to think that the trees having faces was one of the funniest things you had ever seen. Or at least you did until the tree spoke to you. You were just intrigued and at first kept looking around the tree for a person. It was only when you found the button to press and make it talk again that you were content. You are full of curiosity, and you have to know exactly how everything works. You are never satisfied until you understand it fully. You also love to press buttons. But honestly Lukas, tell me was it really necessary for you to push the button quite so many times?